The restored Finishing Straight section of the original Race Track will be put to good use and filled with Land Rovers in their varying guises as radio, fire and support vehicles. 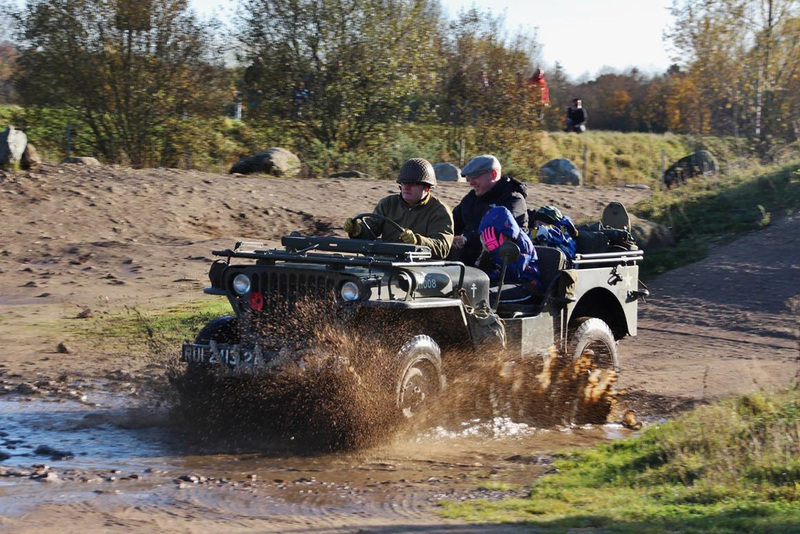 Below them in the Outer Paddock area, visitors will find Daimler Ferret and Scout armoured cars, with heavier trucks and lorries featured by the Race Bays together with iconic Willys Jeeps which celebrate their 77th anniversary this year. This event usually attracts some rare and interesting vehicles. This year, a Russian ‘GAZ’ military utility car from 1969 will be making an appearance alongside ambulances and bomb disposal vehicles. Living History Groups with displays around the site include an encampment and rally point recreating a scene from Normandy in 1944. 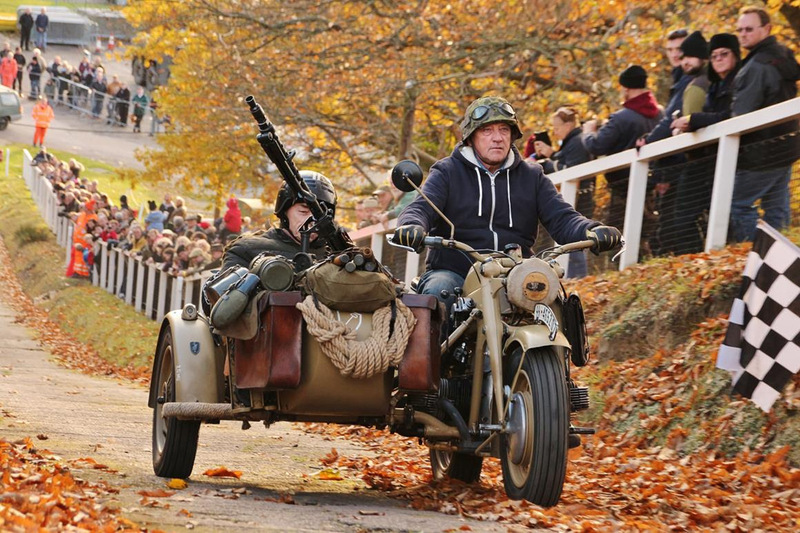 Additionally, a row of BMW and Zündapp motorcycle and sidecar combinations from the WWII era, troop and personnel carriers and swarms of Willys Jeeps have all confirmed their appearance at the event. Visitors will also be able to see inside the award-winning Brooklands Aircraft Factory exhibition housed in the Bellman Hangar which was originally built in December 1940 for the final assembly of Vickers Wellington bombers. The Aircraft Factory and associated displays in the adjoining new Flight Shed tell the story of the ingenuity and skill of the men and women who designed, built and flew aircraft at Brooklands from the early pioneering days in 1908, through two World Wars and ultimately to the development of supersonic flight. The gates open to the public at 10.00 a.m. and at 11.00 a.m. a bugler will herald in a two-minute silence across the site as a mark of respect for those who have been involved in conflicts across the globe. 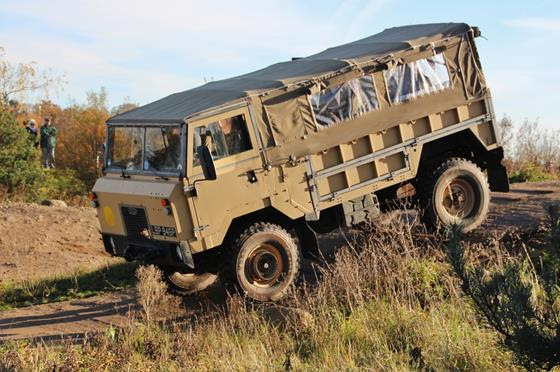 A bus, courtesy of the on-site London Bus Museum, will then take groups of spectators to a viewing area alongside the off-road course at neighbouring Mercedes-Benz World, where some of the lighter military vehicles will be put through their paces on the tricky terrain for an hour from noon. A further selection of the lighter military vehicles will line up to tackle ascents of Test Hill at 2.45pm. The Museum’s collections of cars, motorcycles and aircraft will be open as usual with the Concorde Experience and 4D Theatre (featuring three dynamic simulator rides) running all day. The Museum Shop will be packed with games, toys, books, DVDs and other memorabilia and the Sunbeam Café and outside catering will also be open all day. Admission prices (including London Bus Museum) are: Adults £13.50 Seniors £11.50, Children (5-16 yrs) £7, Family ticket (2 adults and up to 3 children) £35. The Concorde Experience is £5 for adults and £3 for children and rides in the 4D Theatre are Adults £4, Children £2. Visitor parking is in The Heights off Wellington Way for this event – follow event signage.